1. Sauce:Using an immersion blender, puree the fig jam until smooth. 2. Combine the jam, water, and both vinegars into a small pot. 3. Heat until boiling then reduce heat to med-low. 4. Continue to cook until the mixture reduces down to 1/2 the volume. 5. It should end up being thick enough to cover the back of a spoon. 6. This should take about 20 minutes or so. 8. ROCCAN Rolls: Get your veggies ready. 9. For the cabbage you can either buy pre-shredded, or shred your own. 10. For the carrots, peel and use a grater to shred. 11. For the mushrooms wipe off any dirt. 12. I used my blender to quickly chop them, but you can use a food processor or even a knife and do it by hand. 13. In a skillet heat 2 tbsp. of grape seed oil. 14. Add the lamb and cook over med-high heat for 10 minutes. 15. Take off the heat and drain any excess fat/liquid from the skillet. 16. Place back on a medium heat and add the mushrooms, and seasonings. 17. Cook an additional 10 minutes. 19. Add the carrots and cabbage. 20. Mix well and set aside to cool. 21. To assemble: Get a small bowl of water ready to dip your finger in. 22. 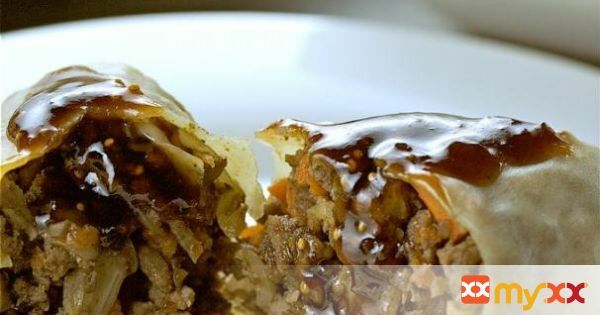 Take an egg roll wrapper and place 1/3 cup of the cooled meat/mushroom mixture into the centre of the wrap. 23. Dip your finger into the water and run it along ALL edges of the wrap. 24. Fold in 2 diagonal sides and press lightly to seal. 25. Starting from either of the remaining 2 (pointed) ends, roll from one end to the other. 26. Press lightly to create a seal. 27. Place roll, seam side down on a parchment lined baking sheet. 28. Continue process till you have made all your rolls. 29. To bake: Preheat oven to 400º F.
30. Lightly brush the rolls with grape seed oil. 31. Bake for 10 minutes. 32. Turn over (and if needed brush with oil). 33. Continue to bake for 5 minutes. 34. Turn broiler on to high and quickly brown to give them a nice finish. 35. Be sure to turn the rolls over to brown each side. 36. To eat: Arrange rolls on a platter. 37. Place the dipping sauce in a bowl.